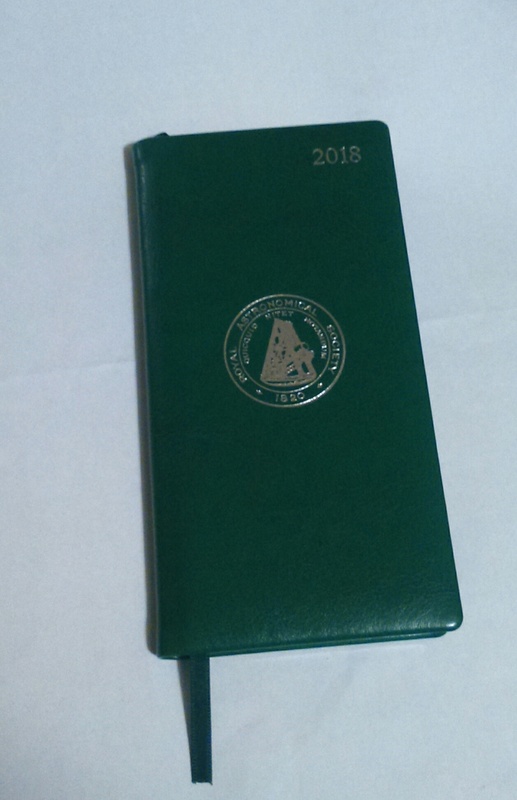 Yet another sign that Autumn is on the way arrived yesterday in the form of my new Royal Astronomical Society diary, which comes with the subscription. This runs from October to October so each year’s new edition usually comes in September. I say `usually’ because mine didn’t come at all last year. It probably got lost in a muddle when I changed address back to Cardiff from Sussex. Each year’s version is usually a different colour from the previous one too. This time it’s a sort of bottle green. Anyway, although many of my colleagues seem not to use them, I like old-fashioned diaries like this. I do run an electronic calendar for work-related events, meetings etc, but I use the paper one to scribble down extra-curricular activities such as concerts and cricket fixtures, as I find the smartphone version of my electronic calendar a bit fiddly.